Carew recently had a four page article featured in Legacy Arts, a niche magazine that focuses on legacy, meaning, and non-career success, founded by Laura Roser. It is distributed to about 70,000 Investment Managers, Financial Planners, Entrepreneurs, and Family Offices. 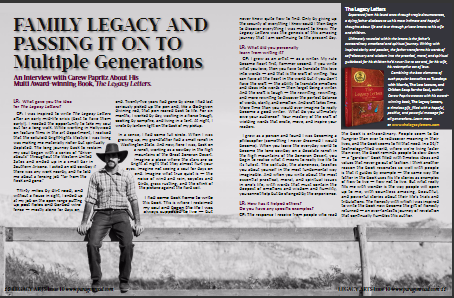 Carew’s article “Family Legacy and Passing It On To Multiple Generations” can be found on pages 10-14.